조계산은 소백산맥 줄기의 끝 부분에 해당하며, 해발 889m의 높지 않은 산이다. 산세는 험하지 않으며, 산 전체가 넓은잎나무로 덮여 있어 철따라 계절의 변화를 선명하게 보여준다. 솟구친 절벽은 비룡폭포, 감초암폭포와 같은 명산의 경관도 지니고 있다. 선암사쪽은 나이가 수십년이 넘는 나무들로 차 있는데 도토리나무, 동백나무, 단풍나무, 밤나무, 느티나무 등이 울창하게 있어 사계절 훌륭한 경관을 연출해 낸다. 그 중턱에는 대각국사 의천 이후 16명의 국사를 배출한 송광사와 선·교종의 중심사찰인 선암사가 자리잡고 있다. 우리나라 삼보사찰 중 하나인 송광사는 혜린대사가 770년경 처음 세운 뒤 건물이 80여 동에 이르는 우리나라에서 가장 큰 규모의 사찰이었는데, 한국전쟁 후 지금은 50여 동만이 남아 있다. 송광사 일대는 연산봉을 비롯하여 여러 봉우리가 병풍처럼 둘러져 절경을 이루고 있어, 송광사 내8경과 외8경이 전해질 정도이다. 아름다운 조계산의 경관과 조계산을 사이에 두고 있는 송광사와 선암사 일원은 울창한 숲과 조화를 이루며 수많은 문화재가 간직된 곳이다. 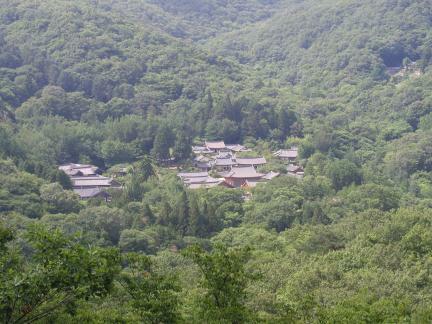 Jogyesan Mountain (889m), which forms the end of the Sobaeksan Mountain Range, is composed of gentle slopes. The entire mountain range is covered with broad-leaved trees whose foliage clearly displays the changes of the seasons. Jogyesan Mountain also consists of Biryongpokpo Falls and Gamchoampokpo Falls. The part of the mountain near Seonamsa Temple is full of decades-old oak, camellia, maple, chestnut, and zelkova trees that create a pleasant landscape all year round. 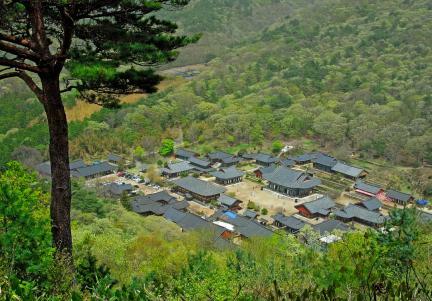 There are two well-known Buddhist temples on the mid-slope of the mountain, namely, Songgwangsa Temple, which has produced sixteen great priests, including Uicheon (aka State Preceptor Daegak), and Seonamsa Temple, which serves as a center for both meditation and the dissemination of Buddhism. The following temples are regarded as the country’s three most representative temples: Tongdosa (for preserving the sariras left by Buddha); Haeinsa (for preserving the Tripitaka Koreana); and Songgwangsa (for producing a considerable number of great Buddhist priests). When Songgwangsa was founded by Master Hyerin around 770, it was the largest temple in the country, comprising about 80 buildings, 30 of which were eventually destroyed during the Korean War. Nearby mountain peaks, including Yeonsanbong, form pleasant scenery. In addition to the attractive scenery, the area contains many cultural heritage objects, including those kept at the two temples located on opposite sides of Jogyesan Mountain.